Dental implant placement is increasing and the use of prophylactic antibiotics in implant dentistry is controversial. The last 3 years has seen the publication of at least 3 systematic reviews (see links) considering the use of peri-operative antibiotics at the time of dental implant placement. The aim of this review was to revisit the available scientific literature regarding peri-operative antibiotics in conjunction with implant placement by combining the recommended methods for systematic reviews and complex systematic reviews. Searches were conducted in the Cochrane Library, Medline, Embase and a range of health technology assessment organisation eg. NICE. Systematic reviews, meta-analyses and randomized controlled trials regarding the effect of perioperative prophylactic antibiotics vs. no treatment or placebo on outcome of dental implant placement were considered. Studies written in English, German, French or Swedish were included. Study selection, data abstraction and quality assessment was carried out independently by two reviewers. 7 systematic reviews were included, 2 were considered to be at moderate risk of bias and 5 at high risk. 10 RCTs were included 3 were considered to be at low risk of bias, 2 at moderate risk and 5 high risk. Pooled RR = 0.39, (95% CI; 0.18 – 0.84; P = 0.02). A risk difference of 2% = NNT of 50 to prevent one patient from implant loss. The scientific evidence for antibiotic prophylaxis during dental implant placement is limited. The current systematic review suggests that antibiotic prophylaxis in conjunction with implant placement gives a modest reduction by 2% of the risk for implant loss. However, the assessment of the included primary studies reveals a high clinical heterogeneity. A sub-analysis suggests that there is no benefit of antibiotic prophylaxis in uncomplicated implant surgery in healthy patients while a beneficial effect in complicated cases cannot be excluded. Upon formulating recommendations for antibiotic prophylaxis, the calculated risk reduction at the patient level should be put in relation to the risk of adverse reactions, side-effects and the emerging problems with antibiotic resistance. This review provides a narrative summary of previous systematic reviews on this topic considering that only two (Dental Elf- 9th Sept 2014 & 19th July 2013) were considered to be of moderate risk. One concern with both of these reviews was the high heterogeneity between the studies included in the meta-analyses. Although one (Dental Elf- 9th Sept 2014) also pooled RCTs and observational studies. The authors focus their analysis on just 4 higher quality RCTs which yielded a pooled RR= 0.39; (95%CI; 0.18 – 0.84) which is very similar to that of the 2013 Cochrane review (Dental Elf- 19th July 2013) which yielded a pooled RR = 0.33; 95% CI; (0.16 to 0.67). Although that review suggests an NNT of 25 (95% CI; 14-100) to prevent one implant failure. 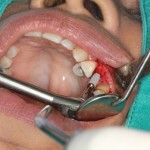 Priority should be given to large pragmatic double-blinded RCTs evaluating the efficacy of prolonged antibiotic prophylaxis compared to a single preoperative dose in those subgroups of people where implant failures are more likely to occur, particularly in those receiving immediate post-extractive implants and augmentation procedures in conjunction with implant placement. It would also be useful to evaluate which antibiotic type is the most effective. Lund B, Hultin M, Tranaeus S, Naimi-Akbar A, Klinge B. Complex systematic review – Perioperative antibiotics in conjunction with dental implant placement. Clin Oral Implants Res. 2015 Jun 16. doi: 10.1111/clr.12637. [Epub ahead of print] PubMed PMID: 26080862.